Security for companies » A Guide On Keeping Your Business Backed Up! The 21st century has made owning and managing businesses easier than it ever has been before; instead of keeping everything inside filing cabinets and taking ages to find things, it’s all stored as data on computers and takes only seconds to find what you want! Everyone works on computers now too, so employees can work more productively, with all of these great advances though there are some drawbacks, and we’re going to show you how to mitigate them! Electricity if obviously what keeps everything electrical in your office running, and this includes your computers and any servers that you might have on site! 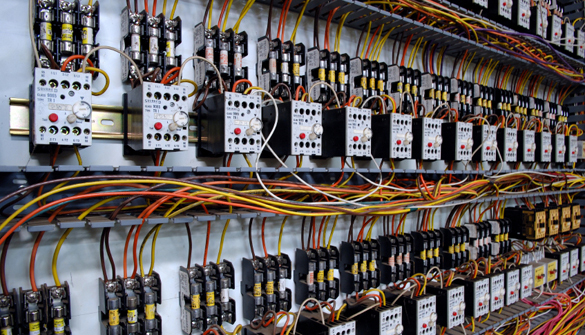 Electrical failures are often impossible to detect and stop because they happen incredibly fast, so you’re going to have to focus on repairing it straight away to get your business back on track. If you don’t, then none of your employees are going to be able to work because none of the equipment works! There is a way you can get around this though; if you hire some electricians and give them their specific roles using electrical contractor software, you’re going to have the right person for the job every time something goes wrong, from the smallest of computer failures to huge system blowouts, whatever happens you’re going to have a small team of organised professionals to sort out any problem that may occur! Electrical wiring isn’t the only thing that can fail; data can too, and sometimes data failures are a result of an electrical one! Having data corrupting in your business is a very bad sign and is something that you should see to doing something about immediately. Corrupted data occurs when the data itself cannot be properly read by the computer; this often means that there is going to be more corrupted data to come, as the effect snowballs if you leave it unattended, so what can you do about it? Well, the best way to deal with it is by backing up your data. This phrase gets thrown around alot these days, but what does it actually mean? Well, by backing up your data it means that you are making another copy of it and storing it on a separate system. This copy is constantly made to be up to date, and so whenever something happens to your main system, you can quickly copy the files that you have backed up right back in! There will be nothing wrong with these files as they have come from a separate system, meaning that they’re not going to suffer the same woes that your other files did because they were never there in the first place. If you’re quite a data heavy company it’s very recommended to do this because if you have a data meltdown and you’re not backed up, you’re in trouble! Unfortunately, with the widespread use of the internet, some people have figured out to use it for their own ends and are able to install malicious files, or actually get into your system itself. This is something that is illegal yes but it is very difficult to police, so as a business you need to look after yourself here and make sure that you’re covered! Installing antivirus on your systems is possibly the best way to protect yourself from any kind of external attack, whether it be from a hacker or a planted virus, but what are both of these things and what does antivirus do about it? A hacker is someone that uses software exploits in order to access files in your system. This comes will a lot of dangers because once they’ve accessed your files they can make their own copies of them, alter them all or delete them all completely which would be a disaster for a business as you’d have to start from square one again. A virus is a software that’s installed onto your computers without you knowing about it and can serve a multitude of purposes; sometimes they are there to log keystrokes in order to log in to accounts, or to get bank details or even to completely destroy the system it’s on. Antivirus systems are able to block all of this through the use of encryption and firewalls, meaning that it’s incredibly hard to get into your system and if someone manages it they then have to decrypt everything so you can feel safe! By downtime we are referring to the amount of time that your business is down whenever any of these things above happen. Downtime is when you start losing money because your business either isn’t doing anything, or isn’t doing as much as it could be, so how do we get around this problem? Well, we have to make sure we have spares of everything! You’re going to want to keep spare computers and laptops to use when things go down, so that your employees can continue working meaning that you lose out on less money, hopefully none at all if the problem is small enough and you have enough spares! Some issues cannot be fixed in a day, so you have to be well prepared to deal with the aftermath of them. All of these things are going to help your business from preventing bad things from happening to your data and computers, and hopefully make the recovery time from when these bad things happen much shorter! If you have antivirus, potential hackers are going to have a very difficult time getting into your system, you’ll have everything backed up just in case you need it, you’ll have electricians on site to sort out any problems that might be had and you’re going to have the spare laptops and computers to replace them whilst they’re being repaired! Sometimes when your computer’s start breaking down too often, it means you need to consider getting a new office PC, but what are your options and why should you be doing it? Well if you read this, you can make up your mind for good! Backup copies are duplicate copies of data or of the entire hard drive on a separate storage medium. They are very important as if something happens to your data, you always have a recent copy to rely on, decreasing the damage you will have. Myriad backup services on the Internet are available for both enterprises and consumers (see cloud storage). Backup of your personal or corporate data is an important part of the security process and that is why we have this new section called Backup and Storage with the best solutions available.